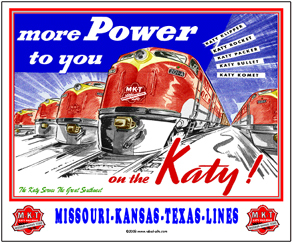 Missouri-Kansas-Texas Railroad will forever be known as the KATY. 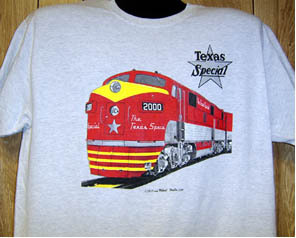 She operated many beautiful passenger trains including the Texas Special. Products bearing individual marks are licensed marks owned by Union Pacific Railroad Company and are used under an active license agreement. AVAILABLE NOW. 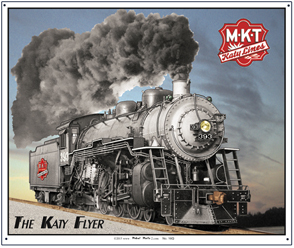 Beautiful new design featuring the famous Katy Flyer steamer used to power the Katy Flyer passenger train. So authentic you just might feel the heat and smell the smoke. Beautiful Lehigh Valley streamlined steam locomotive styled by famous industrial designer Otto Kuhler, (Cue-ler). Lehigh Valley had a fleet of these beautiful locomotives that pulled their passenger trains including the famous Black Diamond. Coffee Mug featuring the Missouri-Kansas-Texas Railroads beautiful Katy Flyer steam locomotive. Same image as the Katy Flyer mouse pad. Coffee Mug featuring the Missouri-Kansas-Texas Railroads logo superimposed over the paint scheme of its diesel locomotives. 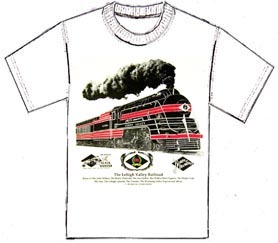 A very unique way to present the railroads logo. Katy Coffee Mug with an old advertisement promoting the coming of KATYs new diesel power. A very colorful and unique coffee mug. 6 inch x 6 inch square tin Green logo sign as used by the Katy Railroad. 6 inch x 6 inch square tin sign of the Katy Railroads Katy Lines Logo. 6 inch x 6 inch square tin sign of the Katy Railroads Steam and Katy Lines logo. 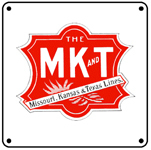 6 inch x 6 inch square tin sign of the MK&T logo which preceeded the MKT logo used in the 40s and 50s. A very rarely seen logo. 6 inch x 6 inch square tin sign of the Katy Railroads MKT Lines Logo. 6 inch x 6 inch square tin Red logo sign as used by the Katy Railroad. 6 inch x 6 inch square tin steam logo sign of the Katy Railroad. License plate featuring the Missouri Kansas Texas Railroad , the MKT or KATY license plate with several logos and an old steam locomotive. 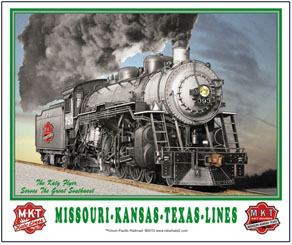 Mouse pad featuring the beautiful steam powered Katy Flyer passenger train. Mouse pad featuring an advertisment ran by the Katy Railroad letting its customers know that new fast and powerful diesels were on their way. 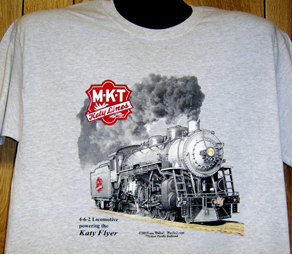 Colorful image of one of the MKT Railroads light and fast steam locomotives that pulled the famous Katy Flyer passenger trains throughout the mid-west. Note unique logo with Katy Lines script. Sign featuring historic logos used by the Missouri Kansas Texas Railroad during it long existence. 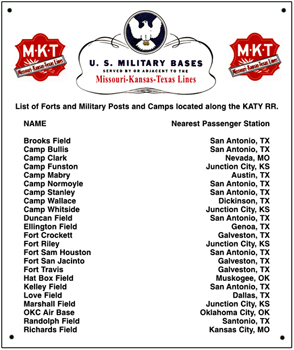 Sign contains US Military Bases on or near the Katy Railroads Lines during the 1941 buildup of America's Armed Forces. 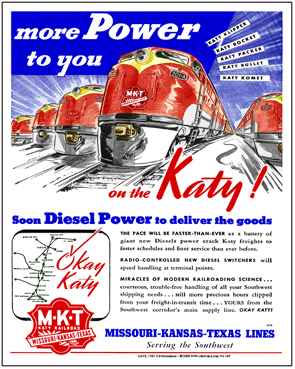 Tin sign featuring nostalgic advertisement of the Katy Railroad promoting the fact that new and powerful diesels were on the way! Sign featuring a 1941 era map of the Missouri-Kansas-Texas (KATY) Railroad. 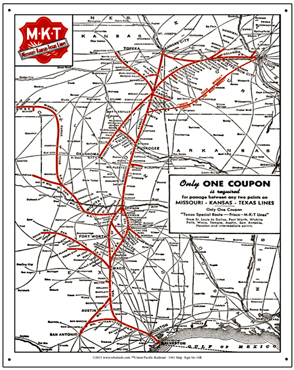 Interesting to see all of the small towns the KATY served and the special route taken by the Texas Special passenger train over a portion of the FRISCO Railroad. 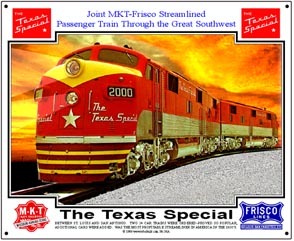 6 inch x 6 inch square tin logo sign of The Texas Special, joint passenger train of the MKT and Frisco railroads.